One of the things I've really enjoyed about Project Pan is forming new opinions about products I've really hated or loved in the past. For instance, I discovered that I absolutely hated Garnier Fructis' Sleek & Shine Smoothing Milk after having previously adored it. Or that Burt's Bees' Beeswax lip balm isn't as drying or terrible as I remembered it being. Trader Joe's Nourish Shea Butter Hand Cream has been a surprise, though sadly not the good kind. I bought a tube of the stuff last year at a friend's recommendation. He knew that I'd been getting into paraben-free lotions and happened to have some on hand, so I tried it and liked how quickly it absorbed and, of course, that it was paraben-free. At the time, I'd recently gotten into Kiehl's Ultimate Strength Hand Salve with its incredible hydration without greasiness, and I was looking for a cream that could perform similarly without parabens. At $1.99 for a 2 ounce tube (59 mL), it's affordable, and I raved about the product in 2013. 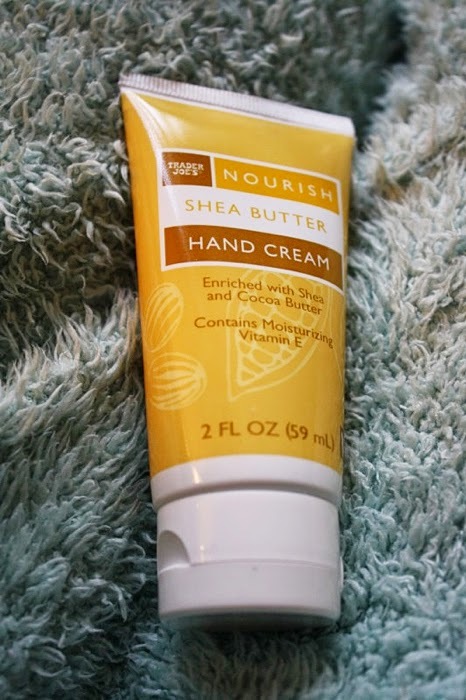 Abundant in natural moisturizers like shea butter, cocoa butter and almond oil, Trader Joe's Nourish Shea Butter Hand Cream is rich without being greasy. It also contains moisturizing vitamin E and sunflower oil, to help guard against the elements. Initially, I found the texture pleasant -- thick, but not difficult to work into the skin. I wrote in March 2013 that the "... moisturization doesn't last as long as Kiehl's, but it definitely lasts more than one or two hand washes for me, which is better than almost every other lotion or hand cream I've tried. It also doesn't leave any sort of film on the hands and absorbs very quickly..." It's not an all-natural product by any means, so the formula shouldn't be terribly mercurial -- but I found that once summertime came, the formula became really tacky and gave my hands an unpleasant and sticky feeling that never really went away. The cream contains dimethicone, which may account for the stickiness. The scent of the product didn't really change -- it's fragrance-free, which basically means it's plasticky smelling (to me, at least). Also slightly annoying was its packaging. Packaging is usually an afterthought for me, but when I am doing Project Pan, it comes to the forefront as I try to use up every last drop. In concert with the cream's sticky nature, the tube made squeezing out any last drops next to impossible. I don't typically cut open toothpaste tubes or containers because I'm quite good at getting product out the traditional way, but I could tell that there was a fair amount of product stuck to the sides of the tube that I couldn't squeeze out. When I cut the tube open, I saw that I wasn't wrong. I definitely wouldn't repurchase the product, but I would still recommend checking it out if you use up travel-sized lotions at a fairly quick rate and are looking for a paraben-free and fragrance-free formula. Ingredients: Water, Caprylic/Capric Triglyceride, Glycerin, Stearyl Alcohol, Shea Butter, Steareth-21, Stearic Acide, Steareth-2, Dimethicone, Cocoa Seed Butter, Sweet Almond Oil, Sunflower Seed Oil, Tocopheryl Acetate, Cellulose Gum, Disodium EDTA, Polysorbate 20, Polyocrylate-13, Polyisobutene, Iodopropynyl Butylcarbamate, Metylisothiazolinone, Sodium Hydroxide, Citric Acid.